The Helios Prototype was the fourth and final aircraft developed as part of an evolutionary series of solar- and fuel-cell-system-powered unmanned aerial vehicles. AeroVironment, Inc. developed the vehicles under NASA's Environmental Research Aircraft and Sensor Technology (ERAST) program. They were built to develop the technologies that would allow long-term, high-altitude aircraft to serve as atmospheric satellites, to perform atmospheric research tasks as well as serve as communications platforms. It was developed from the NASA Pathfinder and NASA Centurion aircraft. AeroVironment Chairman Paul MacCready shows a cross section of the AeroVironment/Helios Prototype wing spar. 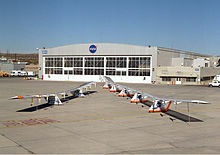 The NASA Centurion was modified into the Helios Prototype configuration by adding a sixth 41 feet (12 m) wing section and a fifth landing gear and systems pod, becoming the fourth configuration in the series of solar-powered flying wing demonstrator aircraft developed by AeroVironment under the ERAST project. The larger wing on the Helios Prototype accommodated more solar arrays to provide adequate power for the sun-powered development flights that followed. The aircraft's maiden flight was on September 8, 1999. The ERAST program had two goals when developing the Helios Prototype: 1) sustained flight at altitudes near 100,000 feet (30,000 m) and 2) endurance of at least 24 hours, including at least 14 of those hours above 50,000 feet (15,000 m). To this end, the Helios Prototype could be configured in two different ways. The first, designated HP01, focused on achieving the altitude goals and powered the aircraft with batteries and solar cells. The second configuration, HP03, optimized the aircraft for endurance, and used a combination of solar cells, storage batteries and a modified commercial hydrogen–air fuel cell system for power at night. In this configuration, the number of motors was reduced from 14 to ten. Using the traditional incremental or stairstep approach to flight testing, the Helios Prototype was first flown in a series of battery-powered development flights in late 1999 to validate the longer wing's performance and the aircraft's handling qualities. Instrumentation that was used for the follow-on solar-powered altitude and endurance flights was also checked out and calibrated during the initial low-altitude flights at NASA Dryden. Helios Prototype flying wing moments after takeoff, beginning its first test flight on solar power from the U.S. Navy's Pacific Missile Range Facility on Kauai, Hawaii, July 14, 2001. The Helios Prototype is an ultra-lightweight flying wing aircraft with a wingspan of 247 feet (75 m), longer than the wingspans of the U.S. Air Force C-5 military transport (222 feet (68 m) or the Boeing 747 (195 or 224 feet (59 or 68 m), depending on the model), the two largest operational aircraft built in the United States. The electrically powered Helios is constructed mostly of composite materials such as carbon fiber, graphite epoxy, Kevlar, Styrofoam, and a thin, transparent plastic skin. The main tubular wing spar is made of carbon fiber. The spar, which is thicker on the top and bottom to absorb the constant bending motions that occur during flight, is also wrapped with Nomex and Kevlar for additional strength. The wing ribs are also made of epoxy and carbon fiber. Shaped Styrofoam is used for the wing's leading edge and a durable clear plastic film covers the entire wing. The Helios Prototype shares the same 8-foot (2.4 m) wing chord (distance from leading to trailing edge) as its Pathfinder and Centurion predecessors. The 247-foot (75 m) wingspan gives the Helios Prototype an aspect ratio of almost 31 to 1. The wing thickness is the same from tip to tip, 11.5 inches (29 cm) or 12 percent of the chord, and it has no taper or sweep. The outer panels have a built-in 10-degree dihedral to give the aircraft more lateral stability. A slight upward twist at the tips of the trailing edge helps prevent wing tip stalls during the slow landings and turns. The wing area is 1,976 sq ft (183.6 m2)., which gives the craft a maximum wing loading of only 0.81 lb./sq. ft. when flying at a gross weight of 1,600 lb. The all-wing aircraft is assembled in six sections, each about 41 feet (12 m) long. An underwing pod is attached at each panel joint to carry the landing gear, the battery power system, flight control computers, and data instrumentation. The five aerodynamically shaped pods are made mostly of the same materials as the wing itself, with the exception of the transparent wing covering. Two wheels on each pod make up the fixed landing gear—rugged mountain bike wheels on the rear and smaller scooter wheels on the front. The only flight control surfaces used on the Helios Prototype are 72 trailing-edge elevators that provide pitch control. Spanning the entire wing, they are operated by tiny servomotors linked to the aircraft's flight control computer. To turn the aircraft in flight, yaw control is applied by applying differential power on the motors — speeding up the motors on one outer wing panel while slowing down motors on the other outer panel. A major test during the initial flight series was the evaluation of differential motor power as a means of pitch control. During normal cruise the outer wing panels of Helios are arched upward and give the aircraft the shape of a shallow crescent when viewed from the front or rear. This configuration places the motors on the outer wing panels higher than the motors on the center panels. Speeding up the outer-panel motors caused the aircraft to pitch down and begin a descent. Conversely, applying additional power to the motors in the center panels caused Helios to pitch up and begin climbing. From 2000 to 2001, the HP01 received a number of upgrades, including new avionics, high-altitude environmental control systems and SunPower solar array composed of more than 62,000 solar cells installed on the upper wing surface. These cells featured a rear-contact cell design that placed wires on the underside of the cells, so as not to obstruct the cells' exposure to solar radiation. On August 13, 2001, the Helios Prototype piloted remotely by Greg Kendall reached an altitude of 96,863 feet (29,524 m), a world record for sustained horizontal flight by a winged aircraft. The altitude reached was more than 11,000 feet (3,400 m) — or more than 2 miles (3.2 km) — above the previous altitude record for sustained flight by a winged aircraft. In addition, the aircraft spent more than 40 minutes above 96,000 feet (29,000 m). As the aircraft climbed through 2,800 feet (850 m), according to the subsequent mishap investigation report, "At about 30 minutes into the flight, the aircraft encountered turbulence and morphed into an unexpected, persistent, high dihedral configuration. As a result of the persistent high dihedral, the aircraft became unstable in a very divergent pitch mode in which the airspeed excursions from the nominal flight speed about doubled every cycle of the oscillation. The aircraft’s design airspeed was subsequently exceeded and the resulting high dynamic pressures caused the wing leading edge secondary structure on the outer wing panels to fail and the solar cells and skin on the upper surface of the wing to rip off. The aircraft impacted the ocean within the confines of the Pacific Missile Range Facility test range and was destroyed. Most of the vehicle structure was recovered except the hydrogen–air fuel cell pod and two of the ten motors, which sank into the ocean." "Lack of adequate analysis methods led to an inaccurate risk assessment of the effects of configuration changes leading to an inappropriate decision to fly an aircraft configuration highly sensitive to disturbances." "Configuration changes to the aircraft, driven by programmatic and technological constraints, altered the aircraft from a spanloader to a highly point-loaded mass distribution on the same structure significantly reducing design robustness and margins of safety." Glide ratio 18 to 1 21 to 1 ? ? ? Airspeed kts(km/h) 15–18 (27–33) 16.5–23.5 (30.6–43.5) ? Empty Wt lb(kg) ? ? ? 1,322 (600) ? Payload lb(kg) 100 (45) 150 (67,5) 100–600 (45–270) 726 (329) ? This article contains material that originally came from the web article "Unmanned Aerial Vehicles" by Greg Goebel, which exists in the Public Domain. This article incorporates public domain material from websites or documents of the National Aeronautics and Space Administration. 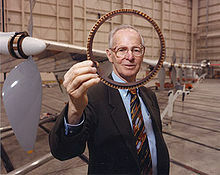 ^ "Aviation and Space World Records". Fédération Aéronautique Internationale. Archived from the original on 16 October 2013. Retrieved 14 October 2013. Wikimedia Commons has media related to Helios Prototype. This page was last edited on 11 August 2018, at 12:19 (UTC).